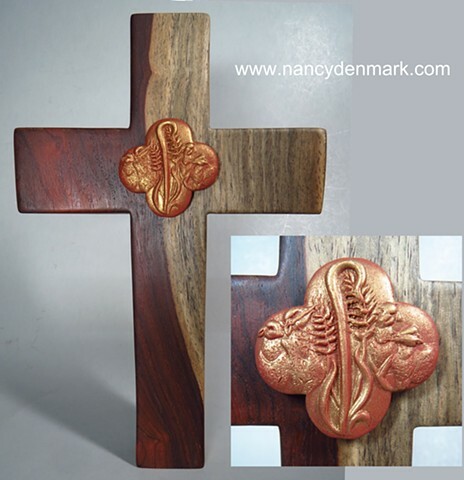 *The theme of this cross is about our relationship with our Lord as the "sheep of his pasture" and our own call to "feed his sheep" by taking the gospel to the ends of the earth. *The shepherd's crook, reminds us that Christ is the Good Shepherd, and can be a symbol of pastoral care received as well as given. *Wheat represents Jesus as the Bread of Life and the harvest reaped from sowing the Gospel. Jesus said to them, "I am the bread of life; he who comes to me shall not hunger, and he who believes in me shall never thirst." *The quatrefoil is an evocative or suggestive cross, as opposed to an obvious cross. In historic Christianity, the four petals of the quatrefoil represented the four evangelists Matthew, Mark, Luke and John who wrote the Gospels. They can also represent the "four ends of the earth," or North, East, South and West, serving as a symbol of our call to take the gospel to the corners of the world, or ends of the earth. A quatrefoil is constructed with four equal foils or lobes, representing equal proportion and symmetry. Each foil is balanced and round, suggesting wholeness and harmony. It doesn't protrude or intrude, it fills and includes, it is whole. It is a symbol of inclusivity. It can be a symbol of global communion, global oneness. Lacking sharp external edges, it can remind us that somehow, our faith walk and that of others must co-exist compatibly, to proclaim the truths of our own tradition without hard edges or harsh boundaries.